At the time of the interview, Caroline was performing as Margaret Hyman in Arthur Miller’s Olivier award-winning drama, Broken Glass, directed by Iqbal Khan, at the Vaudeville Theatre. 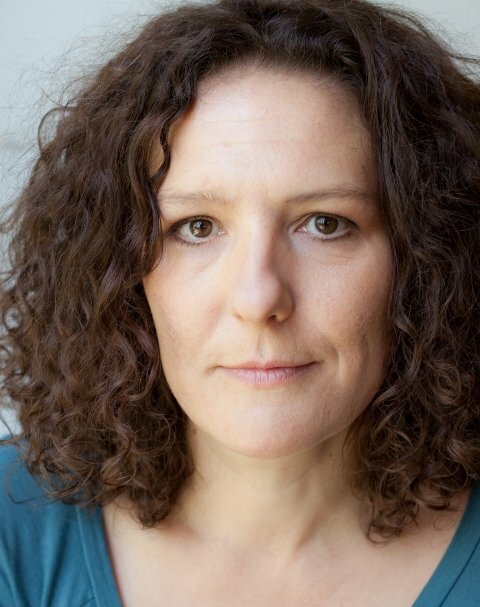 Caroline is an accomplished actress who has starred in numerous plays including in the West End, and has also appeared in over 35 television programmes and films. Caroline recently took some time out from her busy schedule to answer a few questions about herself and her career – enjoy! At what age did you discover your ability to entertain others as an actress? Haha… Well where does it begin? I vividly remember playing a golden goblin in gold lamé knickers and a gold net poncho, going “one, two, three, hop” round in a circle with the other three year-olds while some older kids tried valiantly to get through a scene on the other side of the stage in a school play (that still has my mother weeping with laughter at the memory). But I think a production of Medea in my first term at university with a director called Rod Bolt opened my eyes to how electric performing in theatre can be and gave me an inkling of what I could tap into. Did anyone in particular inspire you to take up a career in performing arts? I had some great teachers at school who opened my mind to literature and performance: Etain Kabraji and Janet Gough. Most actors have an English teacher that they credit with starting them off. They propelled me to university, to do an English degree and there my fate was sealed. What roles did you perform in your stage and television debuts and what can you remember of those occasions? My first paid theatre job was playing Fraulein Kost in Cabaret in Harrogate. She gets to close the first half singing Tomorrow Belongs to Me – goosebumps every night. Cabaret was followed by The Provok’d Wife and Serious Money, rehearsing the next one in the day while playing the former at night. It was heaven after drama school, to be actually doing it, all day and all evening too. Monday morning at eight on my first TV job (Casualty) saw me getting introduced to Clive (cameraman) who was one end of a bath while I was to be having a shower at the other end. So we shook hands, said hello and then I took my clothes off, which would have been hideous if he hadn’t been such a gent. My character had been raped which was certainly an intense first TV role and I felt like I had a real responsibility to be truthful. The director (Bill Pryde) was great, as were the other actors, so it was a pleasure to have something to get my teeth into. You have numerous stage, television and film credits. Do you have a preference for acting in front of a live audience or the camera? Acting for camera can be great when you get a decent part to play and a director who is interested, then there can be a fantastic level of creativity at work all round, but the reality can sometimes be that the character is chopped liver or the director has decided everything they require from you before you get there…in which case TV is just work, and not very creative. You are part of a big team, which is great, but things that are important for an actor, like rehearsal, say, can sometimes get squeezed out. The chain is only as strong as its weakest link on TV, be that the Boom Op’s tired arm or the weather. Plus of course the storytelling aspect of TV happens in the edit – it’s a director’s medium, in the end, so if the director is great and the script is great – two big “ifs” – then TV can be wonderful both to do and to watch. In theatre if the lights go out or the set falls over the relationship at work is still that between the actors, the play, and the audience. It’s alive, in that moment, right there, and that’s a different thrill, and paradoxically what happens under that paper moon can be more ‘true’ than a scene shot under a real moon. A great play is a work of art, and one that cannot fully live without interpretive artists to inhabit it, much like a piece of music, so when the stars align and you get to do a great play with good actors and a director who furthers the work plus, lets not forget, an audience, well then, there’s nothing like it. Theatre feels like my medium at the moment, mind you, that may be because I am involved in a great play and haven’t had a nice bite of a TV cherry for a while. Of all of your acting roles to date, which has been the most demanding as an actress? Physically demanding: in Lysistrata the stage was thick sand so we all got thighs of steel, and it involved acting in half masks which is a whole discipline in itself, at least within a proscenium arch. I did a lovely TV job for Granada called Bare Necessities which involved getting really fit very fast, which was a challenge, but that stuff is always fun to take hold of and run with. The psychological side: the journey you take when you explore a character’s motivations and responses, well, that’s part of the work. Sometimes the more extreme people are easier to grasp than someone closer to yourself. A character will take its space in my imagination though, and sometimes they occupy my dreams so I haven’t always enjoyed living with some of the psychologically disturbed people I’ve played. Has anyone in particular been your inspiration or role model along your acting journey? There are actors I admire and I try to see in everything they do, because I love their work. Mark Rylance is one. Generally though, I try to take my inspiration from life and other art forms. Which has been your favourite stage and/or television role? Playing Lysistrata in the amphitheatre at Epidaurus was a highlight. The play was first performed there in 412BC, and the audience all know the play really well. I did a movie in Hungary called Bolse Vita that I loved, but that was as much to do with being in Budapest for a month and the director’s way of working as the character. The Shakespeare plays I have done have all been highlights, Rosalind and Lady M in particular because they are such meaty parts. You are now appearing in Arthur Miller’s Broken Glass at the Vaudeville Theatre. What is it like performing in the play? It’s a real thrill. The stars have truly aligned on this one. Arthur Miller has written a full, rich feast of a play in Broken Glass, plus he writes actors’ gold; Iqbal is a dream director who is constantly urging you to go forward while having exquisite taste and the cast couldn’t be better. Everyone is alive in the moment with each other, inhabiting this big expansive story which is at the same time a chamber piece with just six actors, a cellist, two chairs and a bed. How would you describe your character of Margaret Hyman? I wouldn’t want to limit her by trying to describe her. She is multi-faceted, three-dimensional (thank you, Arthur!) and contains the odd contradiction, as we all do. I’d rather hear you describe her to me having seen the play. Or rather, I could describe her, but I’d have to write you a three page essay about her and her myriad of hopes and fears. During the play and talking about life, one of Margaret’s lines is “you draw your cards face down, you turn them over and you do your best with the hand you’ve got”. What do you think about that philosophy? Well, it’s practical, which is very Margaret. But it’s easy to say and hard to do if you turn over a real busted flush of a hand in life. Margaret has a good life with Harry, albeit one with the complications that come from being a nice WASP country girl from Minnesota who fell for a charming Brooklyn Jewish doctor. I think I’m less fatalistic than she is and believe more in the power to change, but then my life as a twenty-first century woman has a great deal more freedom than Margaret’s and Sylvia’s to whom she is speaking in Brooklyn in 1938 just after the depression. In your current role how do you like to prepare before the start of the play? Broken Glass concludes its run in mid-December, what have you got planned next? Er… Some sort of holiday, I reckon. Are there any particular roles that you would love to play or any actor/actresses that you would like to perform alongside? Everything I read or see has a part in it I’d like to play. Some of them are even parts I might conceivably be cast in at some point in my life. Mrs Lovett in Sweeney Todd, now there’s a part for later on. All Shakespearian women. Anything by Arthur Miller. How do you feel when your husband (and or son) watches you perform on stage? My son hasn’t seen me on stage yet as I haven’t done anything remotely suitable since he’s been old enough to be interested (he’s nine). Broken Glass is, I think, rather mature thematically for him, while Scorched was just too harrowing in subject matter. I’m fine with my partner seeing me on stage. How would you say the audiences differ in a regional theatre compared to the West End? I think audiences in cities all around the country are pretty sharp – sometimes quicker on the uptake than a West End crowd. Certainly the Liverpool audience, say, are sharp as a tack and extremely discerning. When we took King of Hearts to Liverpool they absolutely loved it – a satire on the Royal Family and the political suits – it went down a storm. I’m lying on a rather uncomfortable dressing room sofa at the moment so all I can think of is lying on a comfortable sofa. What would you say to any young actor or actress thinking about a career treading the boards? Do you really have to do it? Why? Sort out the part of you that wants validation, that will just get in the way. Develop yourself as a whole person, a creative being. Give yourself the choice of acting jobs you want to do by having another way to earn money that you enjoy. Accept that time not working is part of the job and learn how to deal with it without it affecting your sense of self, plus cultivate your friendships that have nothing to do with the business, the people who will take the piss out of you, those people will stop you turning into a self-obsessed neurotic. Ha ha, that doesn’t sound very encouraging, does it?! But that’s the stuff I wish I’d been told. It can be a brutal business, so it’s wise to sort out your ego early on, I think, then you can enjoy it as it comes. Thank you Caroline for taking time out to answer the questions. Best wishes for Broken Glass, and of course your future projects.